Bestowed on Baylor graduates who have made a distinct contribution to their particular profession, business or vocation and in doing so have brought honor to Baylor. His talent for coaching is exemplified by nine medal-winning track and field Olympians. Clyde Hart has developed generations of Baylor student athletes during the past half century, and we honor his significant contributions through the presentation of the Distinguished Achievement Award. 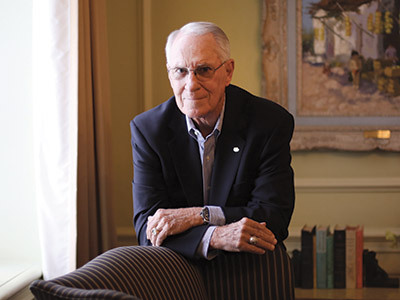 As a state-of-the-art stadium bearing his name rises along the Brazos River in honor of his 55 years of experience as a Baylor coach and student athlete, Clyde Hart (BBA ’56), the director of track and field/400 meters and architect of “Quarter-Miler U,” still believes in selling the University first and the program and facilities afterward. A champion sprinter, Hart garnered a scholarship to Baylor, where he began in 1952. After graduation, he worked for an oil company in Wink, Texas, and then taught and coached at Little Rock Central High School. In 1963, Hart became Baylor’s head track and field coach, a position he held for 42 years until retiring in 2005 to become Baylor’s director of track and field/400 meters. Olympians Michael Johnson, Jeremy Wariner and Sanya Richards-Ross are among the nine athletes he coached in six straight Olympic games to win a total of 13 gold, two silver and two bronze medals. His Baylor men’s 4x400-meter relay teams have earned outdoor All-America status and captured 20 NCAA titles. Hart has coached 34 national champions, and his teams have turned in 10 World-Best performances. One of Hart’s proudest accomplishments is the advance-ment of the women’s track program from a physical education course in the early 1970s to a distinguished NCAA Division I program today. Selected as USA Track & Field’s 1996, 2004 and 2006 Nike Coach of the Year, Hart is a member of the Arkansas Sports Hall of Fame, the USA Track & Field Coaches Association Hall of Fame, the Texas Sports Hall of Fame, the Baylor Wall of Honor and the Baylor Athletic Hall of Fame. He was named the U.S. Olympic Committee’s National Track & Field Coach of the Year in 1996, 2004 and 2006. A Big 12 Coach of the Year honoree with multiple Indoor Coach of the Year titles from the NCAA and the Southwest Conference, Hart received the highest track-coaching honor in 2009 when he was named the International Coach of the Year by the International Amateur Athletic Federation. In 1997, he was recognized as a Distinguished Alumnus and has received the W.R. White Award and the Herbert Reynolds Service Award. Hart’s wife, Dr. Maxine Barton Hart (BBA ’56), is professor emeritus of Information Systems at Baylor. Their family includes sons Greg and Scott (MBA ’98); daughter-in-law Kim; and grandchildren Ryan (MBA ’13), Mason, a Baylor junior, and Kennedy Ann. As a young man from Pearsall, Texas, Gale Galloway had the academic and the athletic ability to attend any school in the country. 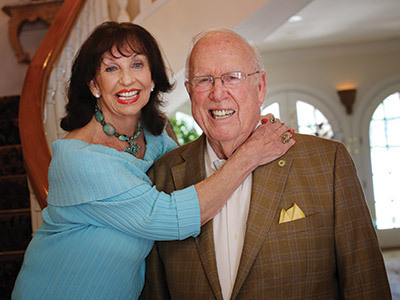 He chose Baylor and, together with his wife, Connie, has for decades invested in the life of the University. We honor their significant contributions through the presentation of the Baylor Founders Medal. In addition to his academic and athletic abilities, Gale Galloway (BBA ’52) maintained a strong work ethic from an early age. His father died when he was only four, and his mother and four siblings worked together to provide for each other at the height of the Great Depression. With his choice of athletic scholarships, Gale ruled out Notre Dame for being too far away for his mother to watch his football games. While on a train ride to Dallas financed by SMU coaches, he hopped off in Waco and never regretted the decision. With its Christian foundation, Baylor felt like home and affirmed his abiding belief that all things are possible through Christ. The University, in turn, gained a student-athlete of distinction. Each season that Gale played for the Bears, the team was nationally ranked. He co-captained the 1951 Orange Bowl team that achieved a national ranking of ninth, the highest postseason ranking of any Baylor team and included 10 NFL draft picks. A leader on and off the field, Gale was in the Air Force ROTC and advanced to lieutenant colonel. Although the Chicago Bears drafted him, Gale was called to active duty and served as an officer in the Air Force until the conclusion of the Korean War. Having honored his commitment to the military and after a brief stint coaching at Texas A&I, Gale transitioned into the oil industry, where he rose to the top position of three Fortune 500 corporations. Connie Bird Galloway of Caldwell, Texas, is Gale’s wife of 48 years. A Baylor Alumna by Choice, she has received the Herbert Reynolds Service Award and the W.R. White Award from Baylor. She holds degrees in psychology from Louisiana State University and the University of Houston and worked in mental heath. Connie served on the Mental Health Board of Louisiana, the State of Louisiana Historical Commission and the board of the Houston Symphony. She is actively involved in Austin’s Helping Hand Home for abused children, among other activities. Gale was a Baylor Regent from 1990-98 and served as Board Chair in 1994-95. In addition to supporting student scholarships at George W. Truett Theological Seminary and in Baylor Athletics, the couple’s interests have included support for the Simpson Athletic and Academic Center, the former Galloway Suites and renovations of Floyd Casey Stadium, and other areas. For his support and service, Baylor has honored Gale with the W. R. White Meritorious Service Award, the Herbert Reynolds Service Award and the Distinguished Alumni Award, among others.